Smelly and disgusting, the scene was anything but pretty. No one would argue that the highway cleanup crew was facing a nasty job. But in spite of sweltering summer heat, foul odor, and grisly conditions; the crew was enthusiastically engaged in the task at hand. It was a dirty job, and they were doing it. In this particular case, the cleanup crew did not consist of human workers but was rather a small flock of turkey vultures. Eagerly focused on the removal of a roadkilled raccoon, the hungry birds actually seemed to be enjoying the project. Already tenderized by the tires of passing motorists, the softening carcass was well on its way to becoming a bloated, fly attracting mess. The odor was offensive. I could go on, but since some of you will be reading this column during breakfast, I’ll skip further detail. Let’s just say that when you combined sight and smell, the scenario lay somewhere on the south side of pleasant. As I pulled aside to watch the birds, it quickly became apparent that the show was not designed for a weak stomach. Instead, it was enough to make most folks wretch. The vultures had an entirely different outlook, of course. For them, the roadkill was a windfall. Nothing short of a four-star buffet. Standing atop the recently deceased furbearer, the birds greedily sliced and slurped a savory blend of guts, hair, carrion, and broken bone. Whenever traffic approached, the huge birds would reluctantly lumber into the air. Once the vehicles passed, the circling scavengers would land for another turn at the table. The scenario was repeated time and again. Despite motorized interruptions, the progress was remarkable. Before long, all that more or less remained of the unfortunate ringtail was an empty hide and widening grease spot. Party over, the vultures slowly flapped away. Catching a nearby thermal, the birds were soon soaring high overhead; no doubt scanning the countryside for their next heat ripened, pre-tenderized meal. 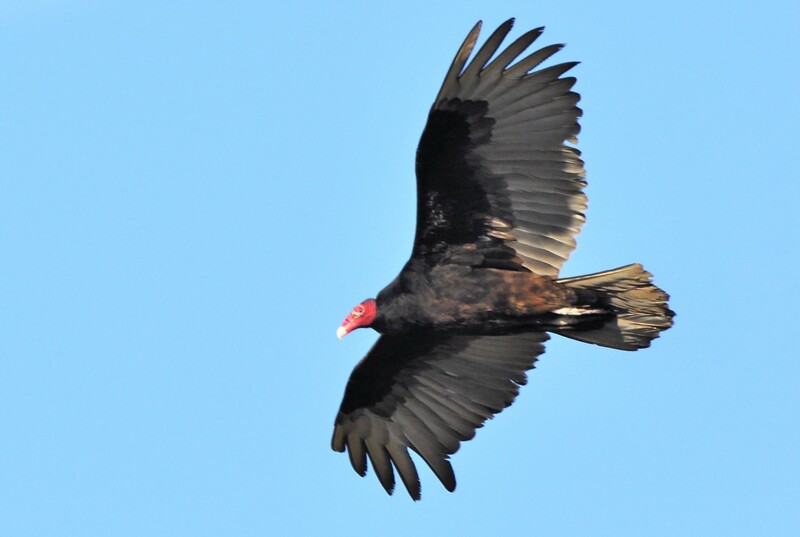 There is no denying that turkey vultures are becoming an increasingly common feature of Iowa’s summer landscape. They glide over corn fields. They roost in our cities. With six-foot wingspans, carnivorous nature, and soaring flight, many people naturally assume that vultures are members of the raptor family. Amazingly, the birds are more closely related to flamingos than to hawks and eagles. Unlike most raptors, vultures do not construct nests. 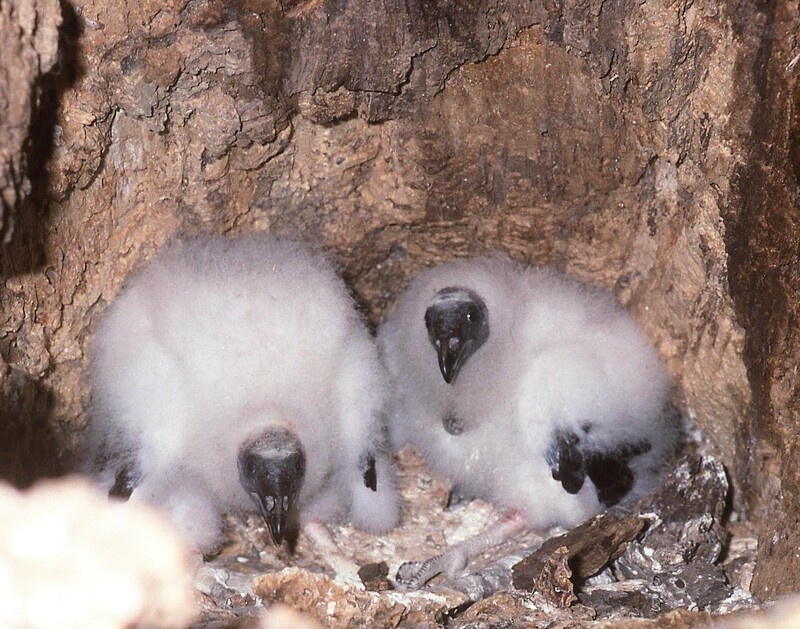 In central and southern Iowa, the huge scavengers frequently utilize natural tree cavities; along the upper Mississippi river they make use of caves and crevices found in limestone cliffs. Elsewhere across the state, vultures are literally moving indoors; readily adapting to wooden platforms or disintegrating piles of hay found in abandoned barns. Growing young have a benign, almost penguin-like appearance. But don’t let the docile demeanor fool you. When threatened by predators, a nestling’s primary means of defense is to projectile vomit its partially digested crop contents in the direction of the intruder. It’s an effective tactic. I’ll never forget the day I crawled inside the cavernous trunk of an ancient, south central Iowa sycamore containing two half grown chicks. The summer heat and humidity were already in the upper double digits. Take it from me; the inside of an active vulture’s nest was no place to be. I started filming. The youngsters mistook me for danger. The horizontal spewing began. Air quality went from bad to worse. So much so, that the English language does not have words to adequately describe the atmosphere inside that tree. I got the shots, but when I crawled back out, all I wanted to do was burn my clothes. Unlike real raptors who catch their food on the fly, vultures subsist on carrion. Consequently, they routinely deal with some extremely nasty food items. While the practice may seem repulsive, it aids in sanitizing the countryside and helps suppress the spread of disease — particularly to domestic livestock. 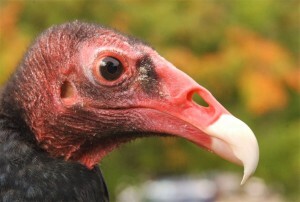 In the process of consuming carrion, vultures also ingest wholesale quantities of potentially dangerous bacteria. To survive the ordeal, the scavengers employ a unique 108-degree digestive system that effectively cooks and destroys any living organisms that may happen to slide down their gullets — including such nasties as cholera, anthrax, salmonella and E.coli. Although vultures have keen eyesight and may locate food while soaring at great heights, they also have a very advanced sense of smell. Unlike other birds, they have the ability to track down a meal by simply following their noses. Natural gas companies have employed the vulture’s acute olfactory to locate suspected leaks in underground lines. After adding a carrion-like scent to their odorless product, gas workers simply sat back and watched the skies as circling vultures pointed the way to defective lines. Whether a vulture depends most heavily on keen vision or acute sense of smell to locate its next meal is an ongoing topic of debate. Several years ago, I had an interesting encounter with a vulture while hunting spring turkeys. After hours of scaling some particularly rugged terrain, I finally gave in to what had become unseasonably warm temperatures. Stretching out on a soft carpet of grass and leaves, I quickly fell fast asleep. Sometime later, I was suddenly awakened by the sound of flapping of wings. Opening my eyes, I was greeted by the intense stare of an adult vulture standing less than a dozen feet away. To me, it appeared as if the feathery scavenger had been sizing me up as a potential meal. Upon discovering that I was still very much alive, the huge bird quickly left the scene. I still think about that big vulture from time to time. Like I said, the day was unseasonably warm and I had been climbing a lot of ridges. Although I’ll never know what led that bird in my direction, I’ve always hoped that it was guided by its eyes and not its nose.